The latest results are available immediately after each draw has taken place in Paris. Be the first to see the winning numbers, check out prize breakdowns from participating countries and find information on where the jackpot-winning tickets were sold. View the latest EuroMillions Results and prize breakdown for Tuesday 16th April 2019. Sorry, it's not currently possible to play EuroMillions from United States. However, we hope to be able to offer this service soon. 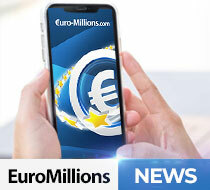 UK Millionaire Maker guarantees at least one UK EuroMillions player will win £1 million in every draw. To win, players must match the entire nine-digit code, made up of four letters and five numbers. Find out more about UK Millionaire Maker here. Find out about the latest EuroMillions winners, information about unclaimed prizes and details of upcoming special draws. A lucky ticket holder from Portugal has become €79 million (£68 million) richer after winning the EuroMillions jackpot in last night’s draw. The top prize had previously rolled over six times in a row since the UK’s Ade Goodchild won £71 million last month. EuroMillions has been creating big winners since it was launched in 2004. With 13 different prize tiers, there are lucky players in every draw and several billion pounds have been paid out in prize money in the UK alone - a figure which is rising rapidly! Could you be the next BIG winner?